I eat out in Reading restaurants a lot but having done the rounds of just about every eating establishment on offer, it was nice to see something new pop up! And just six days after my first visit to Cosmo, I was back again. The experience is unlike any other! Both visits to the restaurant were midweek after 6.00pm with prices at £13.99 per person inclusive of unlimited soft drinks (introductory offer until the end of July). The prices vary according to the time of the day and the day of the week. The cheapest time to visit is during the lunch sitting, which, during the week, is just £7.99 per person. On my first visit, it was clear that Cosmo was a very popular choice for the people of Reading. Even at 6.15pm, the restaurant was extremely busy, but we managed to get one of the last available tables at the front of the restaurant, just a stone’s throw from the dessert counter. We were seated and told that we had 90 minutes in which to eat and a small laminated card was placed on the table, asking that we ‘kindly’ give back the table by 7.45pm. At first, it seemed reasonable, but I later realised that this was not really sufficient. The endless number of staff in the restaurant were quick to approach us and to ensure that we knew how the buffet worked and where to find exactly what we wanted. In a buffet of it’s size, it was quite easy to get lost! I stopped at the self-service drinks machine first and grabbed a Sunkist orange. Other drinks are non-branded cola and lemonade products, which taste just as good as the big name brands we are all so familiar with. From the drinks machine, it was straight into the buffet, and choosing where to start was impossible. This was a buffet offering no end of Indian, Chinese, Japanese, Italian, Mexican, Thai and Vietnamese dishes, and I wanted to try them all, but my plate could only take so much. The food was presented nicely, it was fresh (thanks to being very regularly replenished) and, best of all, it was very tasty! After my first trip for food, a second and third followed. My favourite dishes were the Thai green curry (authentic), the hot crispy pork, the tandoori mushrooms and the Japanese prawns, which were salted and cooked with chilli. And as much as I hate to say it, I did have pizza and that too was excellent. Dishes are arranged according to their countries of origin and diners can help themselves to as much as they like. Alternatively, the live cooking stations (included in the cost) offer cooked to order items, and tasty treats are cooked up right in front of you. For those who cannot cope with international cuisine, a selection of roasted meats, roasted vegetables, chips and onion rings can be had, so there is something for all tastes. Other popular food choices include sushi, various Indian curries and breads, noodles, pastas, spring rolls, prawn toast etc. 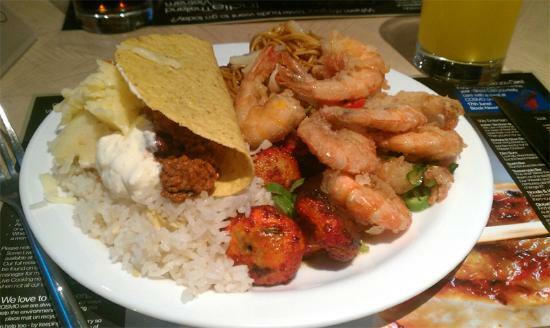 Cosmo is predominantly an Asian buffet with a few other cuisines thrown in too. Efficient staff quickly cleared those plates that were no longer required but it felt, at times, a little too quick. You would often eat your last mouthful of food and the plate would be gone before the food had been swallowed, making the dining experience feel very rushed. The staff know you have just 90 minutes to eat and they want you in and out as quickly as possible, even if they are very friendly about it. 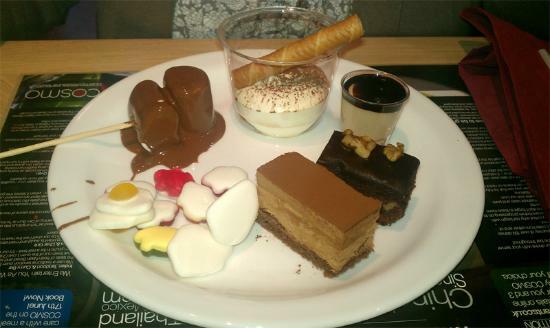 The dessert counter offered a vast selection of desserts, even if many of them are ridiculously small. The majority of the cakes measure no more than 2″ long by 1″ wide! But the selection is excellent. A well stocked freezer of ice cream is available as is a fridge of fresh fruits, along with a chocolate fountain, Haribo-style sweets and waffles. The waffles, in my opinion, should be cooked to order though. They are cooked and left to cool, by which time they are not particularly appetising. Half way through dessert, we approached by a waitress who asked, “Would you like anything else? Teas? Coffees?” to which I said no. Whereas any other restaurant would allow you to at least finish a course before trying to sell you something else, time was running out and it was clear that if we did want anything, it had to be ordered straight away! We needed nothing else as the pair of us were quite full. We just wanted to sit and allow our plates of food to digest, but again, time did not allow. We had less than five minutes to leave the restaurant. Don’t get me wrong, Cosmos is a fantastic experience and I will return again and again. The food is authentic, the selection of 150+ dishes is great, the staff are friendly and the prices are reasonable, but the 90 minute restriction is unfair. There isn’t time to allow a pause between platefuls of food and you leave feeling rather uncomfortable because, again, there isn’t time to allow everything to settle. It is the 90-minute restriction that has resulted in one lost star rating. It is nothing but greediness of the management to allow so little time to enjoy a good meal. Two hours would be much fairer! The booking system also leaves a lot to be desired. On my second visit, after realising just how popular the restaurant was, I booked online. On arriving there in the evening, I was told that there was no record of my booking and staff confirmed that their booking system had “problems”. LUNCH: After a number of visits to the evening buffet at Cosmo, I went along one Saturday afternoon for the lunchtime buffet, which runs from 12.00pm until 3.30pm (finishes at 3.00pm on a weekday) and it was a totally different experience! There weren’t the hoards of people queuing into the street for a table and that’s no doubt because the lunchtime buffet isn’t up to much and it definitely isn’t worth queuing for! The Saturday lunch session costs £8.99 (£7.99 on a weekday) and there isn’t the ridiculous 90-minute limit in place, which is no doubt the result of limited demand for the buffet lunch and less of a need for the tables. The food selection is drastically reduced, putting a Cosmo lunch on par with other buffets in the area – with the only difference being the price. The fantastic Thai selection is missing, the Indian selection is missing, the pizzas are missing (instead replaced by a tray of garlic bread), the dessert selection is acceptable, although very limited, and a number of the trays of food are empty. For a new customer to Cosmo, a first visit could almost certainly be a last! 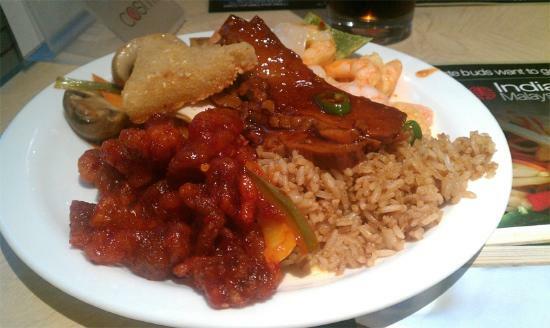 So, the lunchtime buffet is a forgettable experience with an unjustifiably high price tag. Whilst I will continue to enjoy evening meals at Cosmo (and no doubt rave about them all), I won’t visit for lunch again. Looking to keep fit in Reading? Just don’t do with Leisure Connection! Job prospects with a Frozen ATPL? Next story Thumbs up to EssentialTravel.co.uk!